The human race has been trying to develop a fully functional machine translation option for decades. The reason we have mostly failed is that families of languages, and even languages within a single family, differ in a lot of ways. Differences, such as the number of cases, plurals, and phrases used are complicated enough to make it very difficult to create a single engine which could handle all of them. Because of these shortcomings, human translation has been viewed as the default way of translating most of the content in the past decades. This was true until the emergence of more advanced MT options, such as neural machine translation, which was able to produce better results and bridge the gap between human and machine translation to a certain degree. If machine translation cannot create perfect results all the time, why is then even considered an alternative to human translation? The answer to this question is very simple: time and money. Machine translation is cheaper and faster. It costs less than human translation, and it provides quicker turnarounds, lowering costs. Before we start our countdown, let’s make it clear that we don’t think that human translation is superior to machine translation or the other way round. The question is rather which option should be used in a certain situation, as both have their specific use in the localization of your content. Having said that, today we want to define the situations in which human translation is the only way to go. This can be any published content, but in this context we are mainly discussing online content, such as websites. Of course, not parts of a website are equally complicated and important and for the majority, machine translation and human review approach should be enough. However, we think that human translation should be used on the most important landing pages of your website such as homepage, the About Us page, and the Terms & Conditions might require a more human touch. Otherwise, your visitors might be turned off by the quality of the translation, and leave your website immediately. All the good marketing practices cannot make up for a low-quality user experience. Machine translation is still not used for things such as financial audits, as they tend to contain expert opinions which need to be translated without a single flaw. Another good example can be legal documents which will be used in court, as such texts require certified translation by an approved human translator. Other examples can include expert content such as medical research. Read more about expert content in our article about 4 fields that require professional translation. When you are localizing your English website for the Middle East, or for the Chinese market, you need to be aware that all your content needs to be adapted, taking into account various cultural and religious differences. This requires not only translation but also localization and very often transcreation; changing the language but keeping the original message of your brand. Cultural context is something that machines still haven’t comprehended. In the cases listed above, machine translation can play a big role in modern localization workflows, as machine translation can be used to speed up the localization process, only to be reviewed by a native speaker of the target language who will change and adapt the translation as required by the target audience. It is up to you to decide which approach you want to take, but we can support you with any workflow you want to set up. 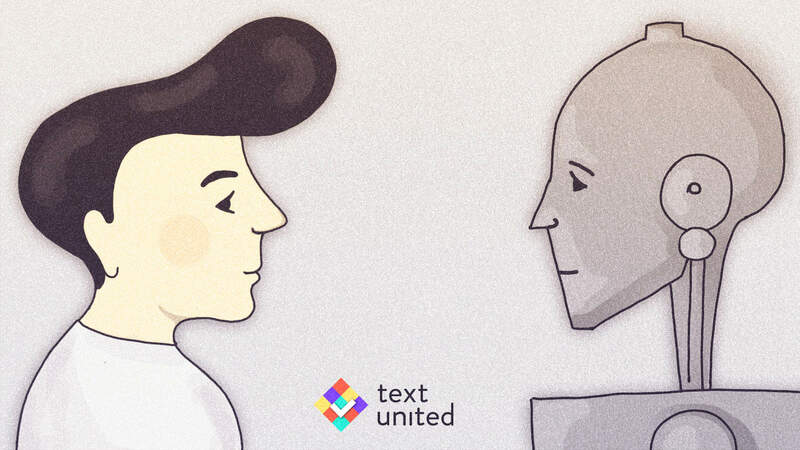 If you do want the best of two worlds, you can test machine translation and human review by signing up to Text United!